Ugh, it's bad out there. I was thinking about running a 3k tomorrow night....forget it! I am still running on Wed nite tho, which promises equally frigid temps. I will wait and see how my inner polar bear feels tomorrow. Tonight he wanted to hibernate more. Helpful, that's me. Thanks for commenting Brenda! Doesn't make me feel better. 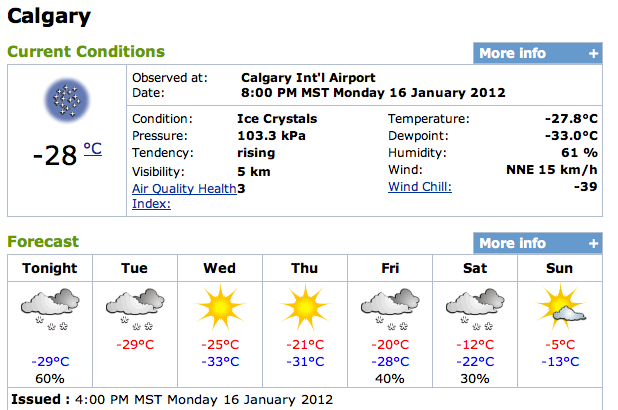 We are usually about 2 degrees colder in Cochrane. No running outside for me until it warms up, but I promise to be impressed if you do it! No need to be impressed. It's cold enough that you'd be thinking "stupid" if I had run outside.